Apt613 was invited to Archery Games, a new recreational facility that celebrates its grand opening in Ottawa this weekend. Inspired (in part) by dodgeball and paintball, the sport is guaranteed to make you sweat and won’t hurt if when you get hit. Standing outside an 8,000 square foot arena before game time, Ramsay Jackson focuses on a foam target in the distance as he shows how to load and shoot “marshmallow tipped” arrows. “Hold the bow with your non-dominant hand and avoid chicken wing arms,” he says, raising his elbow up and down to show the best posture. 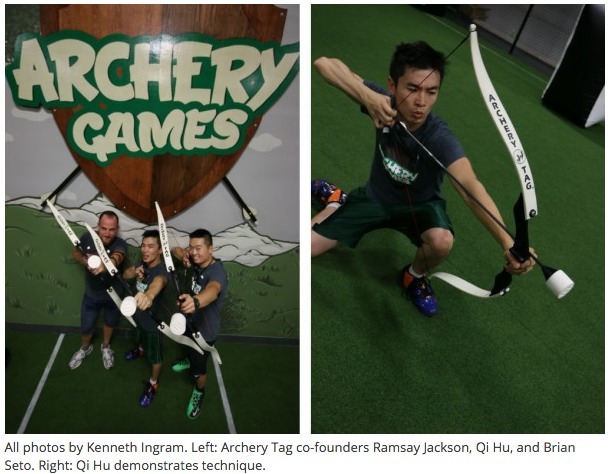 Jackson, along with Brian Seto and Qi Hu are the three co-owners of Archery Games. Together with seven staff members, their new business venture will celebrate its grand opening this weekend and combines foam-based weaponry with elements of dodgeball, paintball, and laser tag for an experience that will surely delight recreational enthusiasts — especially those who tend to shy away from welts because the foam arrows absorb impact and don’t inflict pain. A small crowd of anxious new players surround Jackson and take practice shots under his watchful eye. In a few minutes, players will be outfitted with a mandatory safety mask [made to accommodate eye glasses if needed]. An optional arm guard is also available on site that’s designed to protect you from yourself [new players have a tendency to hit their own forearm with the bow’s string during recoil]. “Each bow is drawn between 24 to 28 pounds,” says Seto, noting that arrows pack a lot of punch when they’re pulled back and released to their full potential. But even at close range, the ‘pop’ that results from a successful hit sounds a lot worse than it feels. One of the most appealing aspects of archery tag is that you come as you are. Players arrive comfortably dressed in sports attire (t-shirts, shorts, and sneakers) and you don’t need to bring anything [although Apt613 recommends that you bring a water bottle because you’re going to sweat — a lot]. As a recreational activity, archery tag was developed in Indiana circa 2011 where the official headquarters for Archery Tag remains. According to the website, almost 400 licensees for archery tag are spread amongst 32 countries around the world including Afghanistan. While most of the official locations are within the USA, Ottawa marks the 18th location in Canada and more than half are in the greater Toronto area. “We tried them all in Toronto,” says Seto, who adds that a lot of attention went into the new space. For example, he notes that Jackson is a carpenter and built the wooden tables in the main lobby as well as the large Archery Games logo that hangs in the arena. In addition to green sports turf, the playing field has inflatable barriers that provide protection from arrows and a canopy of artificial plants that provides the caged enclosure with a distinct feel. “We designed it as an open space with high ceilings for arched shots,” says Seto. The warehouse also has 18 small lockers for storing valuables, as well as bathrooms and a limited selection of refrigerated drinks for sale. Apt613: What can visitors expect? Seto: “The whole entire experience is 75 minutes. That includes 25 minutes of safety briefing, instructions on how to shoot, and target practice. And then it’s 50 minutes inside the actual arena playing archery tag… [including] different games so you’re not playing the same game over and over again.” Seto adds that a minimum of six players is required [three vs. three] and the arena can accommodate up to 20 players at one time. The website says this is 100% safe? S: “There’s no physical contact allowed in here between players. It’s purely just shooting with the arrows.” He points out that there’s a six-foot neutral zone that runs through the middle of the arena and acts as a buffer between opposing teams because it can’t be crossed. Getting hit by an arrow up-close, while less likely, doesn’t hurt . Leaving no doubt, Seto notes that one of the other co-owners was recently “hit in the junk” while playing on television. “But he still stood,” laughs Seto. In addition to Archery Games, the three co-owners are also preparing to unveil escape rooms in the same location this September. 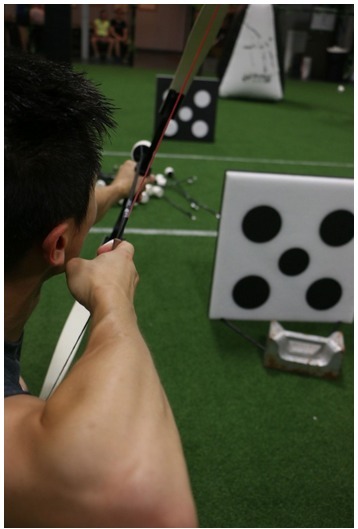 Archery Games is located at 1860 Bank Street Unit 3B. A 20% discount is offered for bookings made on Grand Opening weekend (August 21-23). Book online, by e-mail, or by phone. Recommended for ages ten and up. The cost is $24 per person (plus HST) for safety and training session in addition to 50 minutes of game time.